This is my new project: a trailer dollhouse! And this is my inspiration for it: The Magnolia Pearl Airstream. 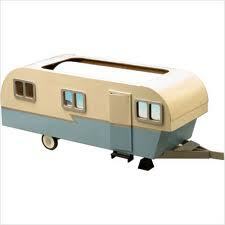 I won't be making an exact replica of this one. But it will have a very strong influence on mine. 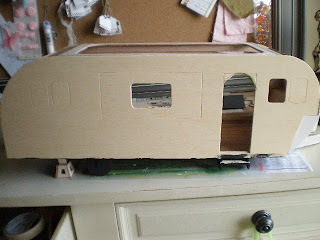 I put the structure together except for the roof and windows. I rounded the front to look more like the Airstream. I did the wood floor.And got started on the very detailed interior. This is the picture that got me all excited. 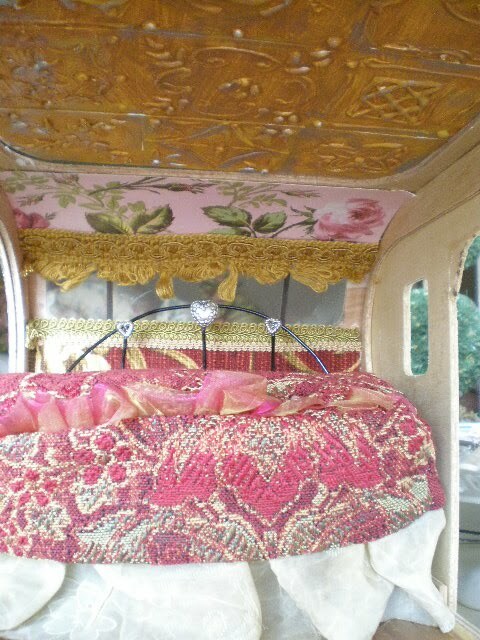 I think this looks so cozy and romantic. I'm layering the wallpaper and putting lots of trim. 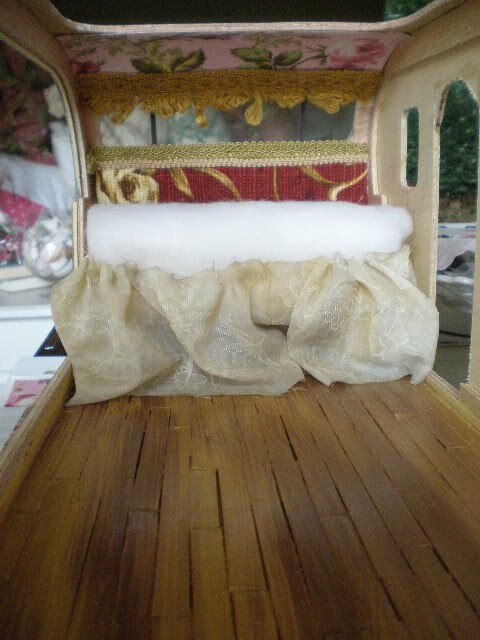 I'm working on the daybed. I dyed the ruffle fabric to look old. I started the bedspread. It needs more ruffles! I also made the iron headboard with black heavy and thick wire. Then I put these heart charms on. That's wonderful! 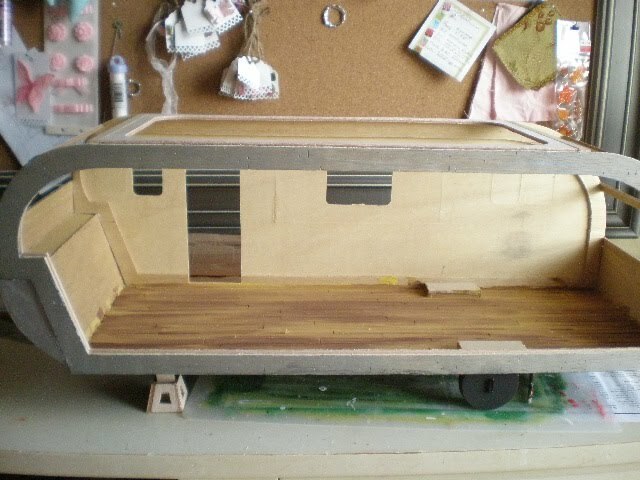 I did the travel trailer about halfway. lol. Was going to make a hair salon, but got stuck. You've given me new inspiration! I can't believe how we seem to be on the same vibe!!!! 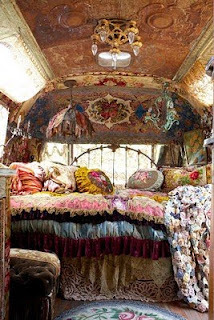 What is not to love about a gypsy caravan ~ full of lace and flowers??!!!! 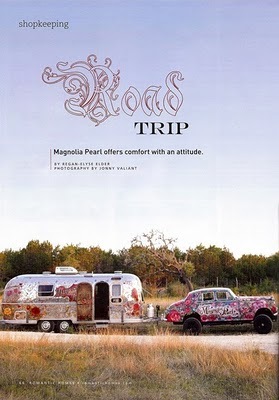 ...I'll be "trailoring" behind you on this adventure, lol!!! 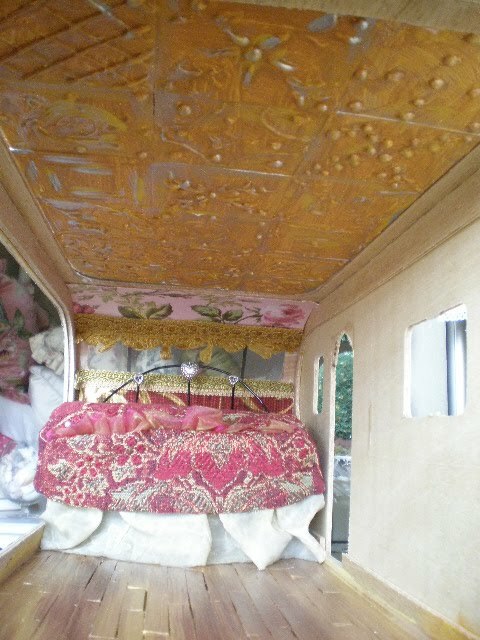 Your travel trailer is looking awesome. It is looking so adorable. I will be checking in to watch the progress. Have a great day. Your Missouri Friend. Has tenido muy buena idea y te esta quedando fabulosa. Felicidades y gracias por el enlace. Wow! Love it. Can't wait to see more. Una gran idea, seguro que te queda maravillosa, estoy deseando ver tus avances. 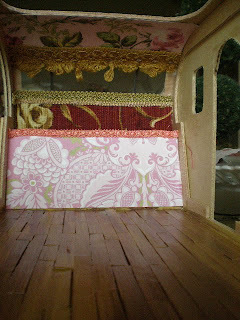 Gypsy Travel Trailer Dollhouse: All Done! Gypsy Travel Trailer Dollhouse: Lights! A Fairy Chair While I Wait!